Harry Rogers made it onto the first manned mission to Mars. Well, the first one since the unknown others hid their ship under that Mayan pyramid. He hopes to find priceless relics of an ancient civilization. Too bad his diabolical family wants them, too. The revelations threaten to set the world ablaze. Those who unlock the long-buried secrets first inherit the galaxy. 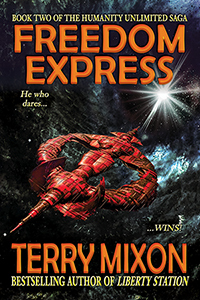 If you love adrenaline-pumping science fiction and grand adventure on a galaxy-spanning scale, grab “Freedom Express” and the rest of The Humanity Unlimited Saga today!